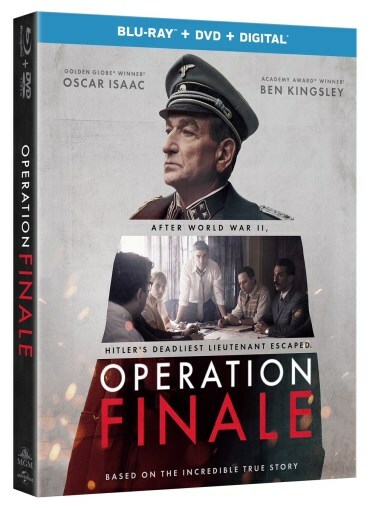 Follow the astonishing true story of an Israeli intelligence agent who brought Hitler’s deadliest lieutenant to justice in the intense and gripping film, Operation Finale, arriving on Digital on November 20, 2018 and on Blu-rayTM combo pack, DVD and On Demand on December 4, 2018 from Metro Goldwyn Mayer Pictures (MGM) and Universal Pictures Home Entertainment. Brimming with incredible performances from Golden Globe® winner Oscar Isaac (Ex Machina) and Academy Award® winner Ben Kingsley (Schindler’s List), Operation Finale is also backed by an amazing supporting cast including Mélanie Laurent (Inglorious Bastards), Lior Roz (Fauda), Nick Kroll (Loving), Haley Lu Richardson (The Edge of Seventeen), Joe Alwyn (Billy Lynn’s Long Halftime Walk), Pepe Rapazote (Narcos) and Greta Scacchi (Brideshead Revisited) . Inside the Operation – Cast, filmmakers, and crew discuss working together, filming in Buenos Aires, and their collective approach to telling such a historically significant story.